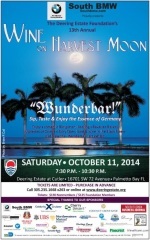 Palmetto Bay – Wine on Harvest Moon is back for its annual appearance at the Deering Estate! 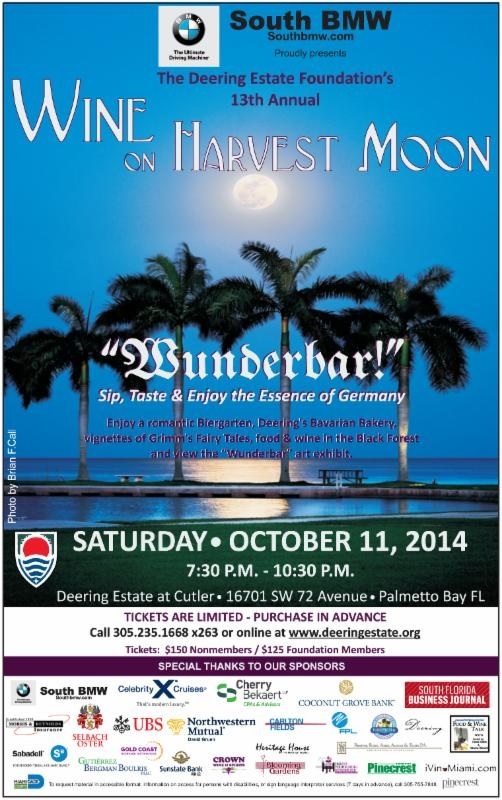 The Deering Estate Foundation is hosting its 13th annual Wine on Harvest Moon event this Saturday, October 11th, from 7:30 to 10:30. Tickets are limited so make sure to get yours in time. Information can be found at www.deeringestate.org or by calling 305.235.1668 X263. Wunderbar! South Florida’s Cultural Arts Park Brings Holiday Cheer for All! Everyone is welcome to come aboard for Family Friday! Starting tomorrow, Friday December 13th, Pinecrest Gardens will be hosting a series of events for the next week or so. Spoken by Maggie Dokic | Discussion: Comments Off on South Florida’s Cultural Arts Park Brings Holiday Cheer for All! 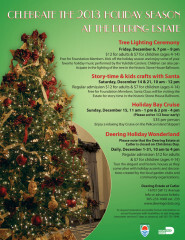 Come Celebrate this Holiday Season with The Deering Estate! With the Holiday Season quickly approaching, the Deering Estate is going to be hosting a special event each weekend in the month of December. Friday December 6 from 7-9 pm there will be a special Tree Lighting Ceremony. Located at Deering Estate at Cutler (16701 SW 72nd Avenue). There will be plenty of music performed by Yuletide Carolers throughout the evening. The fun does not stop there! On December 14 & 21 Santa will be there from 10 am – 12 pm for story-time and kids crafts in the historic Stone House Ballroom! Spoken by Maggie Dokic | Discussion: Comments Off on Come Celebrate this Holiday Season with The Deering Estate! Hey Miami! Get away this Saturday without going far at all. Transport yourself to Australia at the 12th Annual Wine on Harvest Moon at the Deering Estate on Old Cutler, where you can experience the “fine wines, fine food, and fine art” of Australia and New Zealand without having to leave town. The cuisine will be provided by many of Miami’s finest, such as The Ritz Carlton Coconut Grove, Ana Capri, Shula’s 347, Smith & Wollensky, among quite a few other great names. The event is this Saturday, 10/19/13, from 7:30p – 10:30p at the Deering Estate on Old Cutler Road and SW 167th Street. Proceeds from the event will go towards the preservation of the beautiful Deering Estate. You can get full details about the event here. A special offer for our readers | Palmetto Bay. Community Papers is offering their readers free tickets to upcoming basketball games of University of Miami basketball team. Tickets are first come, first served, until they run out. Check it out! Miami Attractions Month is Underway! Just in case you’ve forgotten, attractions month has already started and there are a lot of great deals to enjoy. Among the many discounted prices and specials this year are Miami Culinary Tours, Miami Seaquarium, Fontainer Miami Beach, One Bal Harbour Resort and Spa, Edgewater South Beach and many more. More detailed information is available at the Greater Miami Convention & Bureau’s online tourism guide at http://miamiattractionsmonth.com/ but hurry, it all ends on October 31’st!! 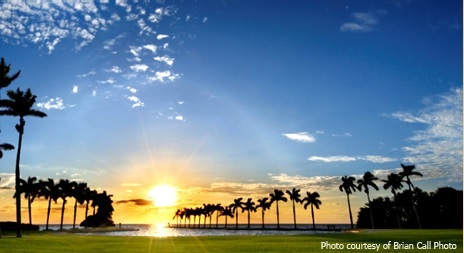 Spoken by Maggie Dokic | Discussion: Comments Off on Miami Attractions Month is Underway!